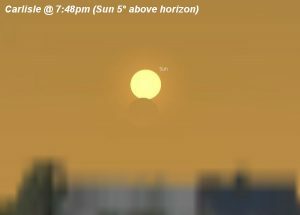 The weather is clear on the western horizon on the evening of 21 August, 2017. Visibility is good on the evening of 21 August, 2017 (i.e. no summer haze). 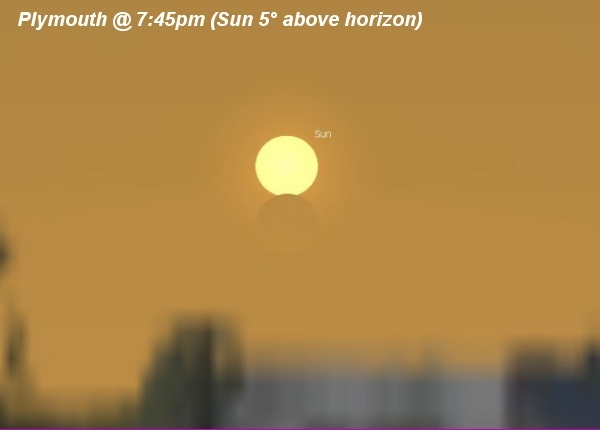 You have an unobstructed view of the western horizon. 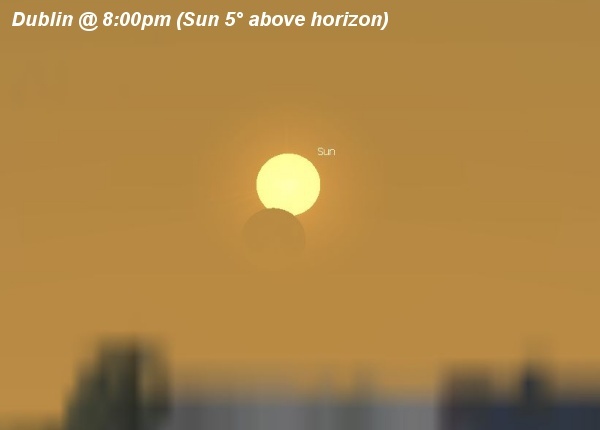 You plan well and have a good sense of timing! You are located somewhere well North or West of the orange line on the UK map shown below. 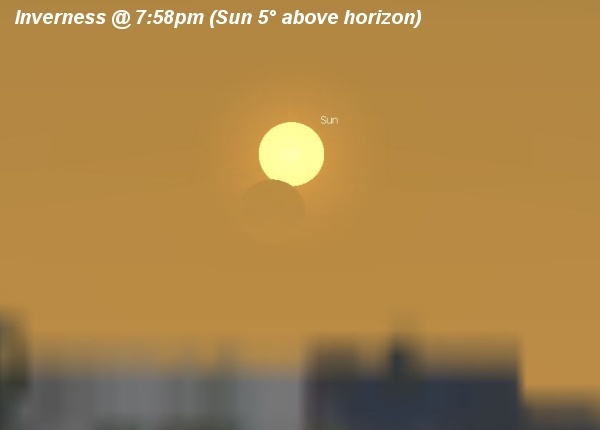 The odd thing with observing from the UK is that the partial eclipse gets deeper the later you watch it despite UK viewers witnessing the very last stages of the eclipse. 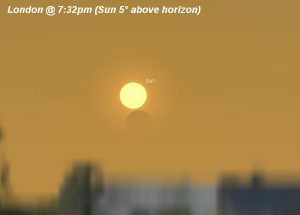 However, the Moon only begins obscuring the Sun when it is below 10 degrees from the horizon which is desperately low for observation. Even when just a few degrees above the horizon, the Moon only takes a tiny ‘bite’ from the Sun. It will have no effect at all on temperature or light levels. Needless to say, observation or photography should only be done using the appropriate safety glasses or equipment to avoid eye damage. It is unsafe to attempt to view this eclipse in the UK without them and the appropriate precautions should be taken at all times. 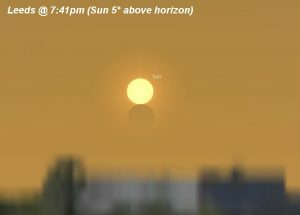 The Moon first begins to obscure the Sun at around 7:41pm BST on the evening of 21 August, 2017 lasting until sunset. Likely not noticeable until a couple of minutes after this time depending on observing methods used. 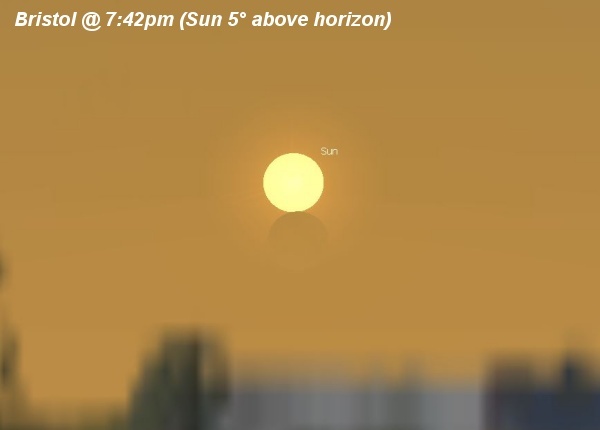 How high the Sun is in the sky at this time varies depending on your location. Below is a list of cities in the UK showing the Sun’s elevation at 7:41pm on 21 August, 2017. 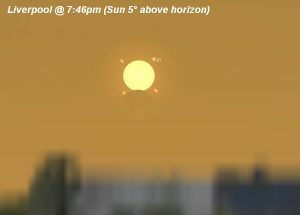 Some cities are listed that are in the ‘no eclipse visible’ zone. 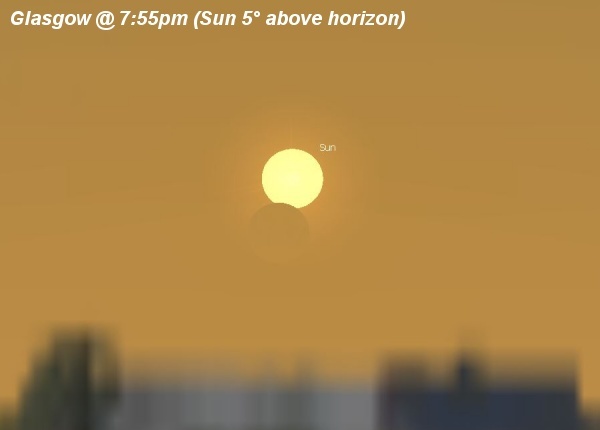 This is because the Sun is below 5 degrees at the point of first contact with the Moon. This is so desperately low that it is considered almost impossible to observe. All illustrations are at the time when the Sun is 5 degrees above the horizon hence why times vary at each location. 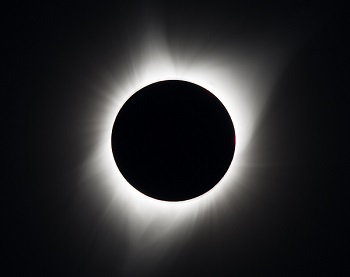 Your next chance to see a total solar eclipse in the UK wont be until 23 September, 2090 where it will sweep across a swathe of south western England. 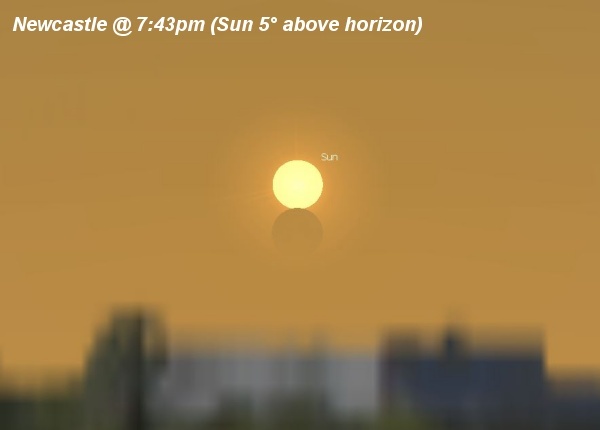 The Moon’s shadow itself we be around 270 miles wide, however only half of this width crosses UK landfall. 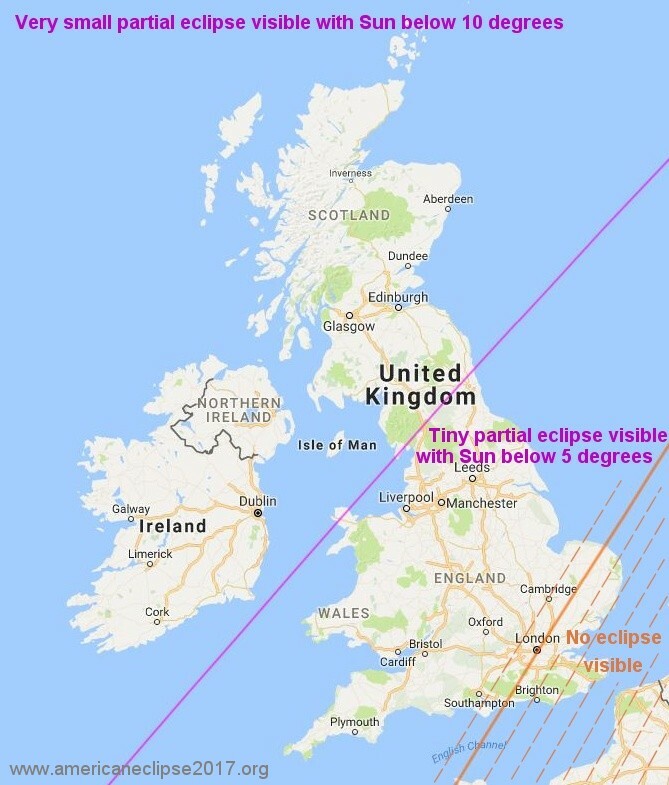 This eclipse location is a strikingly similar but larger corridor to the 1999 eclipse where it clipped the far south western reaches of Cornwall. 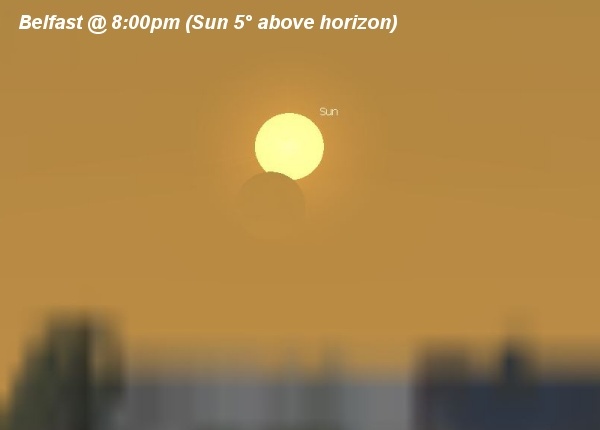 This time Cornwall, Devon, Somerset, Dorset and Hampshire will get the change to witness totality.